Happy #PRBday everyone. 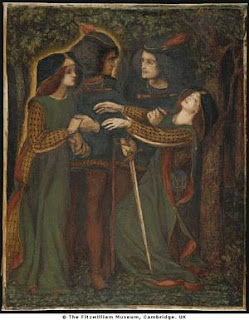 To celebrate here is a use of the Pre Raphaelites that inspired the creation of this very blog. When I last looked at Neil Gaiman I spoke about the writers use of the "story behind the story" trope. This is where a fictionalized version of an established writer or artist' work is inspired by a event that happened to them in the fictionalized world of the story they appear in. This is another case of the trope in Gaiman's work, this time within his famous Sandman series. 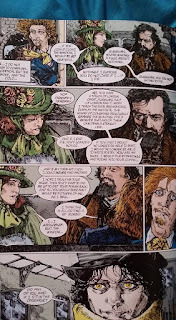 First published in the comics anthology Vertigo: Winter's Edge #3 (2000) The Sandman: How They Met Themselves imagines the story behind Rossetti's painting of 1860-1864 as being based on a jounrey that he, Lizzie Siddal and Algernon Charles Swinburne took. During this winter excursion they meet the personifiaction of Desire (Sister/Brother of Dream, the main character of the Sandman), leading to the events that inspire the painting. Gaiman's use of the character is perfect, from Rossetti using the Guggums nickname for Lizzie and his brash egotistical characterization, Lizzie's jealously and fears over losing Rossetti and Swinburne's plee to Desire (Which I will not spoil, but people who know his history will get a kick out of it). The story is helped by the beautiful artwork of Michael Zulli, an artist with noticeable Pre Raphaelite infulences. His likenesses are beautiful. I wish I could say more about the story but I can't as that would spoil it. It is a narartive that needs you need to come to without much infomation because spoliers rob it of it's imapct. While you can still find copies of Winter's Edge cheeply, you could alternatively buy the much more expensive Absoulte Sandman Volume 3, if only to see Zulli's beautiful artwork in a larger format.